Home » News » Who’s Goin Up? Three from Bradford City, Fleetwood Town, Millwall and Scunthorpe United will be disappointed at the end of the play-offs. The schedule for the League One play-offs has semi-final games at the same time on Thursday 4th May and Sunday 7th May 2017. The winners of the semi-finals will then have two weeks to prepare for their Wembley final on Saturday 20th May 2017. 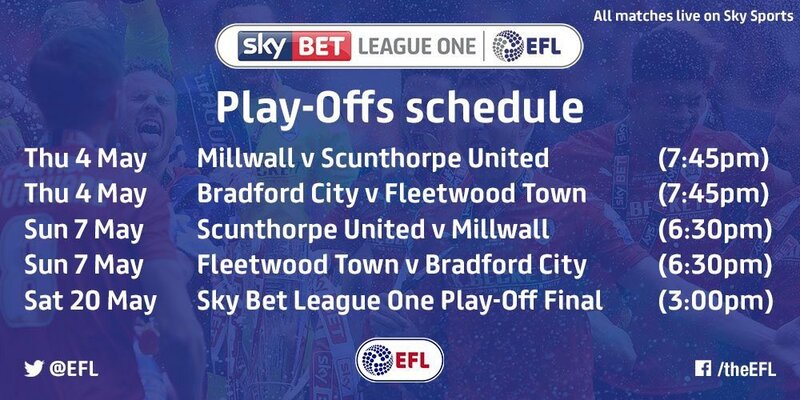 All five play-off matches will be covered live on Sky Sports. Does it matter to Bristol Rovers FC or the supporters of the club which team eventually goes into the Championship?